Trust in Me and do not be afraid of what others can do to you. I have put my trust in God. I will not be afraid. Fear of man is a powerful debilitating force in our world today. It will keep us from taking risks and it will keep us from being the person God made us to be. If we are afraid of what others think, or what they will do to us, we are kept in a prison of their control. God wants us to be free and He does not want us to live in fear. The only way to deal with fear is to embrace the love that God has for us and allow perfect love to drive all fear away. (1 John 4:18) Trust is the key. Knowing that our God and Father has our best interests at heart all the time. 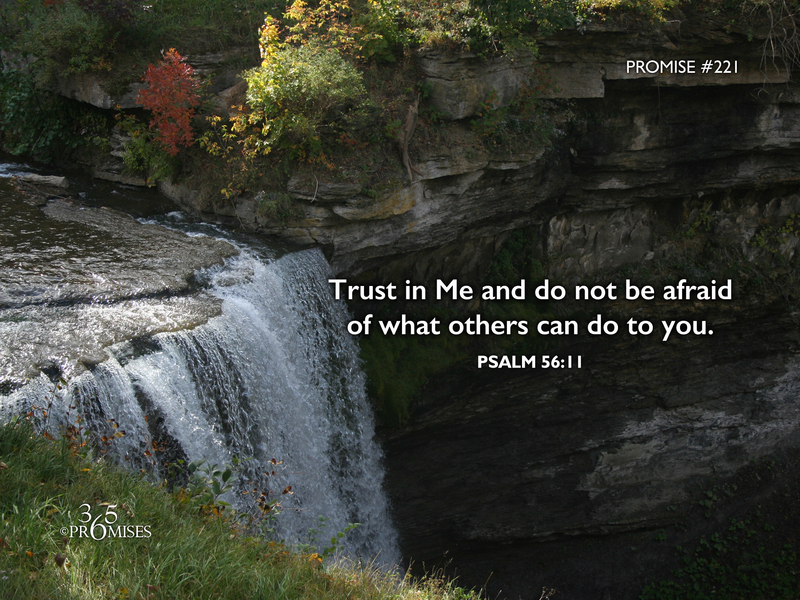 In this promise, the psalmist makes a declaration that he will put his trust in God and not be afraid of what man can do to him. May faith rise up in our hearts today as we agree with Romans 8:31, where the Apostle Paul declares "If God is for us, who can be against us?". May each one of us continue to grow in the incredible freedom of the children of God, and not live in the place of being afraid.